Having a Minnie Mouse birthday?? Want something different than the usual red, black and white? Well, we created it with you just in mind. We start with a light pink gingham and make a square neck dress or swing top and trim the hem with lime green with little white dots grosgrain ribbon ric rac. Each shoulder strap fastens with 2 lime green buttons. 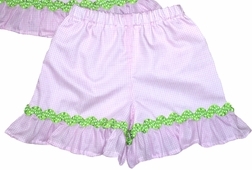 If you choose the bloomers or shorts, they are also light pink gingham with the shorts having the same ribbon ric rac as the dress/top. The bloomers are not trimmed with the ric rac. The front of the dress/top is appliqued with our own birthday design! 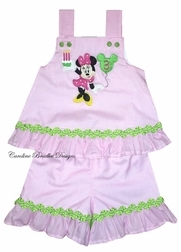 We applique Minnie Mouse dressed in a hot pink with little white dots and give her a cupcake with candles to hold in her right hand. (Note that the first through the third birthday will be actual candles, and for birthdays 4 through 6, the number itself is the candle.) 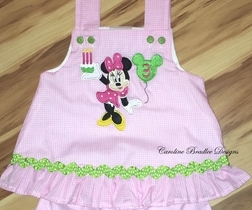 Minnie's left hand has a lime green balloon with the number age your little one is turning in hot pink.